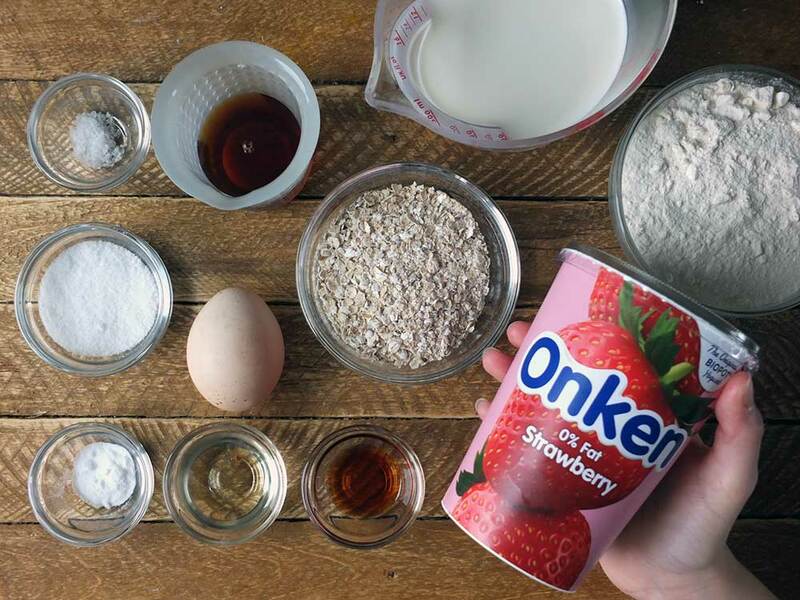 These light and fluffy oatmeal pancakes are easy to make and taste delicious topped with a strawberry yogurt-maple syrup drizzle. In collaboration with Onken. My kids absolutely love pancakes (or crepes, depending on if it’s myself or my husband making them!). I like to make thick, fluffy, American style pancakes (while he makes thin European-style crepes). Both have their place at the table, but for this recipe, I’ve jazzed up the traditional pancake with some oatmeal and a yogurt-maple syrup drizzle. 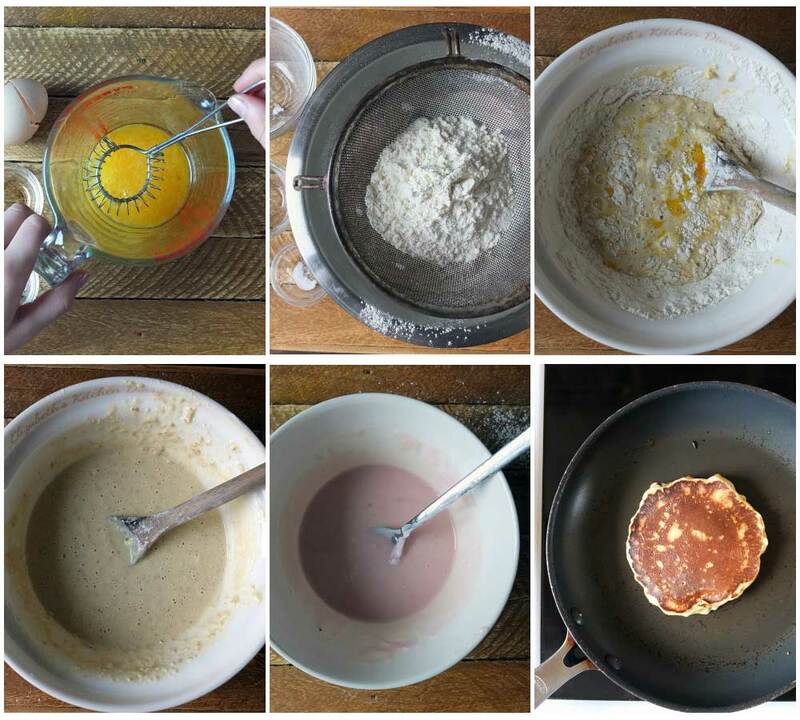 These oatmeal pancakes are super easy to make too – if you’ve got the embedded video in this post playing (it should have appeared at the top of this post when you opened the page and it’s now playing as a sticky sidebar video to your right) – you’ll see our 11-year-old daughter make the recipe as I film. You won’t see it if you’ve got your ad blocker running. These pancakes are more filling than regular pancakes, with the addition of the oatmeal, and they keep for a few days too, in an airtight container. They’re rather delicious cold with a smear of butter for an afternoon snack. Step 1: Place milk and oats in a bowl and leave to soak. Mix egg, oil and vanilla together in a jug, set aside. Step 2: Sift together flour, salt and baking soda. Step 3: Add the soaked oats and the egg mixture. Step 4: Stir until well combined. Step 5: Mix yogurt and maple syrup together in a separate bowl. Step 6: Cook pancakes and serve with fresh fruit and the yogurt-maple syrup. 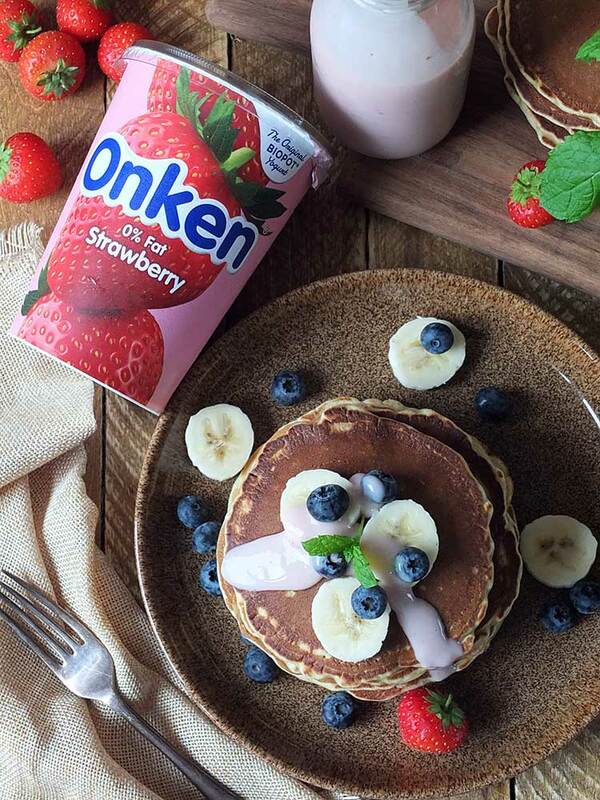 This recipe is made in collaboration with Onken yogurt. They challenged me to come up with three different recipes that could be made from a single pot of their 0% Fat Strawberry yogurt. 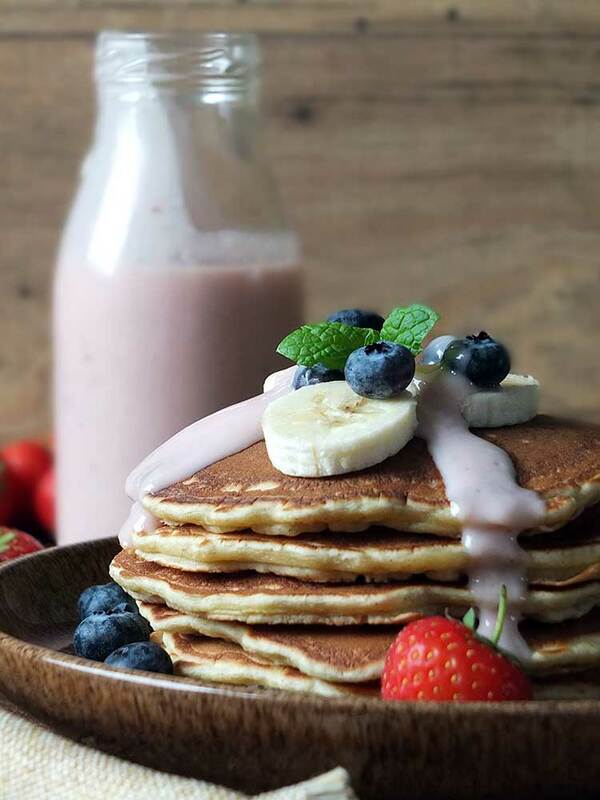 In addition to these oatmeal pancakes with a strawberry yogurt maple syrup, I’ve made a delicious strawberry post-workout protein shake as well as a scrummy French-style strawberry yogurt cake. 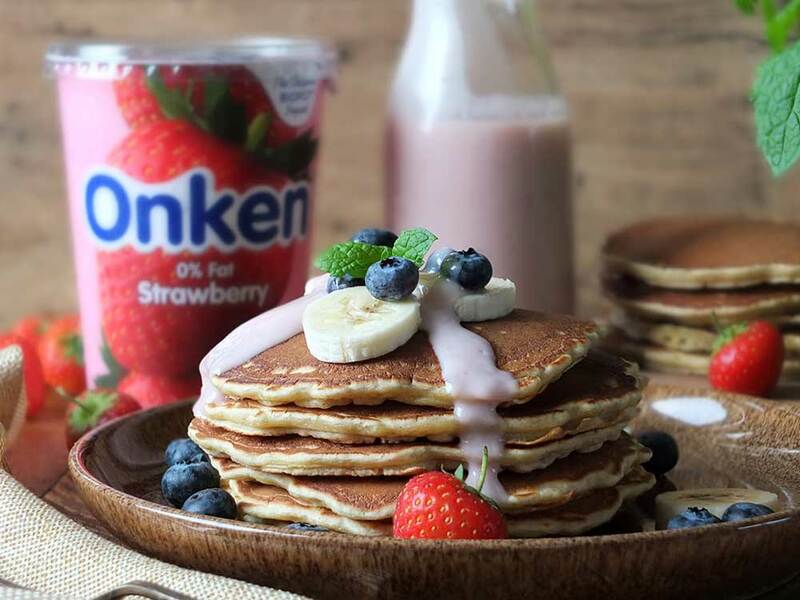 Visit the Onken website and check out their recipes section for these recipes and many more! 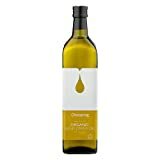 This is a sponsored recipe post for Onken. All thoughts and opinions expressed are our own. Thank you for supporting the brands who make it possible for me to do what I love: mess up my kitchen and share recipe stories! I love oatmeal pancakes, they always seem so filling and slightly less naughty than regular pancakes. I always have a pot of Onken yogurt in my fridge, my favourite is the black cherry, so delicious! I bet these make for a tasty comforting treat! 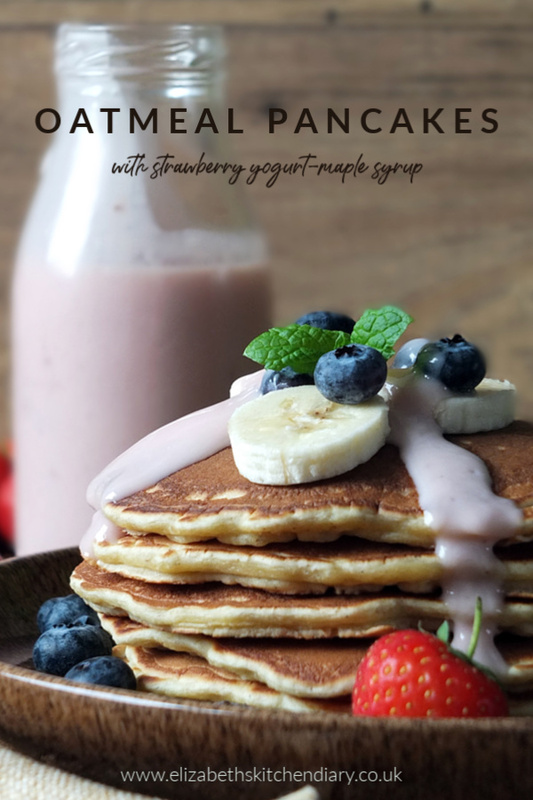 These sounds like a great morning breakfast treat and something that all the family could get involved in making. I love your adaption of the maple syrup with yoghurt, it must have brought a freshness and cut through the sweetness well. 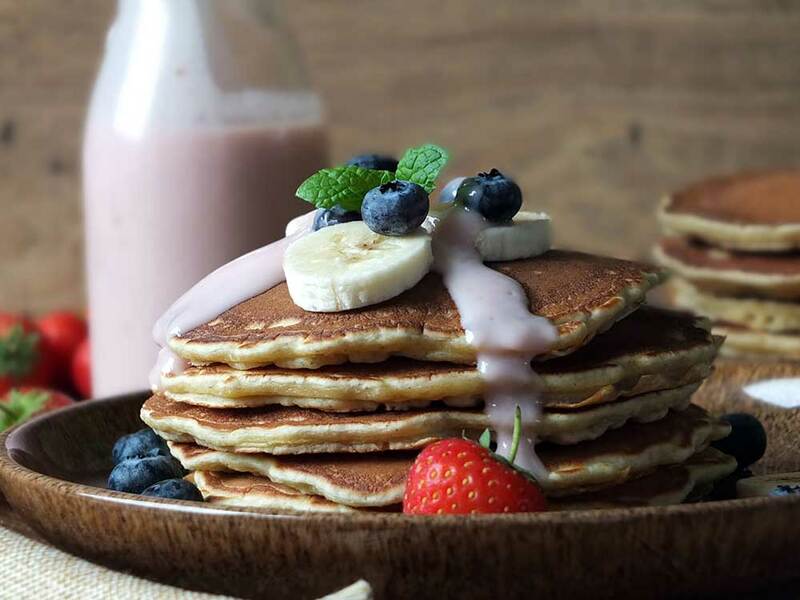 These oatmeal pancakes look absolutely delicious, I have not made pancakes for a while now and want to try these big time. 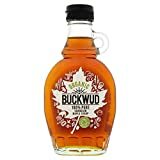 We too love pancakes in our house and these specific pancakes sound like my partners dream – he adores Onken yogurts (like seriously, he would eat pot after pot if I let him) and maple syrup – and pancakes. This would be his perfect dish. They look delicious. OK I 100% want some pancakes now! 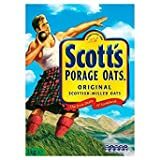 These sound like they would absolutely amazing, I like the idea of using oatmeal as something a bit different as well. Delicious!